Greenwich Metal Finishing eliminates rust and paint from objects safely and efficiently in our state-of-the-art sandblasting facility. 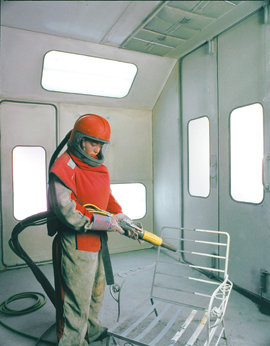 Precision sandblasting service ensures that restorations start with a pristine surface, the single most important step toward a smooth and lasting finish. Greenwich Metal Finishing features a full-size walk-in sandblasting booth and precision blasting compartments. Having our own on-premise sandblasting facility allows us to select the right size cabinet to clean any item, from the smallest pieces to outdoor furniture, and to control the quality of the sandblasting. It also means that we can provide prompt turnaround. Our experienced craftsmen select from aluminum oxide, glass beading, and other media to remove coatings and clean metal without damaging the underlying surface. Specialized techniques completely eliminate the possibility of warping, even with very thin steel, aluminum, and fiberglass panels. In some cases, our technicians can precision-remove individual layers of coating. Moreover, our high-pressure, high-flow rate equipment allows for the rapid removal of contaminants while protecting surfaces and minimizing impact to the environment.